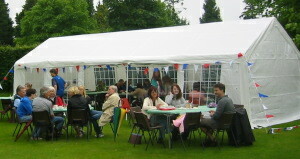 The Longparish Community Association has a party tent which is available for use by LCA members. It was first used at the cream tea on the Midsummer Fun Day in June 2008 and it used at the FoLS May Fayre and as the beer tent at the Fete in September so you may have seen it already. The tent is 10m long by 4m wide and holds about 60 people standing or 40 sitting. LCA will provide the tent and an expert to help put it up. You provide at least three helpers, make a donation (min £30) to LCA and give the expert a suitable bottle. At the discretion of the committee, it is also available free for use by affiliated village organisations for events like the fete. If you’d like to find out more please contact Jeremy on 720459. Organisations which would like to affiliate (£5 per year) should contact the membership secretary, Christine Beresford, 3 Woodwalk Cottages. In case we mislay them, here are the instructions! You can see more about the party tent on the supplier's website where we go it from. Other equipment is available for LCA members and affiliated organisations to borrow. There is a list of the equipment available.